Time for an update to the discussion that started in April 2008 with my post on “Guénon and Jeanne de Salzmann?” The conclusion seems to be that there was a long and mutually respectful relationship between René Guénon and both Alexander and Jeanne de Salzmann, two of the leading followers of George Gurdjieff. The main sources for this are the letter from Guénon to Jacques Masui of March 15 1950 that an anonymous reader kindly posted almost in its entirety as a comment to my original post, and a comment in Roger Lipsey’s Gurdjieff Reconsidered (2019). In his letter to Masui, Guénon concludes that Gurdjieff’s school was not “authentically initiatic” as Gurdjieff was not “attach[ed]… to a particular traditional form.” Despite this, Gurdjieff was “something other than a charlatan,” which from Guénon was almost praise, given how mercilessly he normally condemned those he saw as non-traditional. Further, Guénon tells Masui that he had once known “Salzmann” well (presumably Alexander de Salzmann) and that he had read Peter Ouspensky’s In Search of the Miraculous (1949) in typescript before its publication. In Search of the Miraculous, one of the key texts of the Gurdjieff school, had been circulating for some time in typescript among Gurdjieff's followers before publication, and so was evidently available in more than two or three copies, but even so it is significant that someone had lent a copy to Guénon. For the other side of this relationship we turn to Lipsey, who reports that Guénon’s works were once “all but ‘required reading’ for participants in the Gurdjieff teaching” (p. 279). Lipsey does not give his source for this, but it fits with the reported visit by Jeanne de Salzmann to Guénon in Cairo after Gurdjieff’s death, i.e. in about 1950, for which the source is Whitall Perry’s Gurdjieff in the Light of Tradition (1978). If Guénon had known Alexander de Salzmann well, that would have been in Paris before Guénon left for Cairo in 1930, so a visit by Jeanne de Salzmann in 1950 indicates a friendship lasting more than twenty years. As Lipsey notes, Gurdjieff in the Light of Tradition is an attack on Gurdjieff, and was presumably approved by Frithjof Schuon, so we can conclude that the relationship of mutual respect between Traditionalists and the Salzmanns had ended by 1974, when Perry published (in Studies in Comparative Religion) the first of two articles on “Gurdjieff in the Light of Tradition” that later became the book. My thanks to whoever posted the comment with the letter to Masui, to Xavier Accart for help with the letter and for the reference to Perry for the 1950 visit, and to EL for drawing my attention to the passage in Lipsey. The Financial Times reports a new movie (which its correspondent did not much like) about the Brazilian philosopher and ex-Maryami Olavo de Carvalho. This previewed last week at the Trump International Hotel in Washington DC at an event co-hosted by Steve Bannon and attended by Eduardo Bolsonaro, the son of President Jair Bolsonaro of Brazil. President Bolsonaro himself did not attend the movie screening, but when he held a dinner for conservatives at the Brazilian embassy during his visit to the US, he placed Carvalho on his right and Bannon on his left. Brazilian Foreign minister Ernesto Araújo sat on the other side of Carvalho. A remarkable new book, Wael Hallaq’s Restating Orientalism: A Critique of Modern Knowledge (New York: Columbia University Press, 2018), draws heavily on the work of René Guénon. Hallaq is a distinguished Palestinian-American scholar and intellectual, and his use of Guénon represents a Traditionalist breakthrough into the Western intellectual mainstream. Hallaq’s title is slightly misleading. His book does indeed revisit Orientalism (1978), the highly influential book by another Palestinian-American scholar, Edward Said (1935-2003). But the emphasis is more on the critique of modern knowledge than on the critique of Said, and the critique of modern knowledge is embedded in a fundamental critique of modernity. 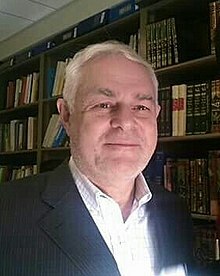 Since then he has written a number of books, most notably A history of Islamic legal theories: An introduction to Sunni usul al-fiqh (Cambridge University Press, 1999) and The origins and evolution of Islamic law (Cambridge University Press, 2005). Recently, he has turned towards more contemporary issues. His The impossible state: Islam, politics, and modernity's moral predicament (Columbia University Press, 2013) argued that an “Islamic state” is an impossibility, and was widely read, also in the Muslim world, in English and in Arabic and Urdu translations. Restating Orientalism moves even further from classic scholarly topics towards contemporary issues. Restating Orientalism is, as has been said, in part revisiting Said’s Orientalism. As Orientalism has been revisited before by many authors, this is not in itself very remarkable. What is remarkable is that Hallaq challenges Said on two points. One is a point that has been made before, that not all Orientalists were as Said paints them. Another point is a more far-reaching one. Said, according to Hallaq, failed fully to understand the phenomenon he was discussing. He placed Orientalist scholarship and literature within the framework of European imperialism, but he did not then put European imperialism within any suitable explanatory framework. The appropriate explanatory framework, argues Hallaq, is modernity. His prime example of an Orientalist who was not as Said paints Orientalists is René Guénon, and Guénon is also an important source for the understanding of modernity that Said missed out. Hallaq discusses and explains Guénon’s thought at length. He also does something that has never really been done before: he introduces Guénon into the intellectual mainstream. At one point, for example, he gives us Guénon’s views on the Is/Ought distinction, referring also to Charles Taylor and Alasdair MacIntyre. The Is/Ought problem is a philosophical classic, raised by David Hume (1711-1776) and most recently addressed by MacIntyre. Guénon did not, of course, address the Is/Ought problem directly, so Hallaq has to interpret Guénon somewhat to bring his thought to bear, but he does this—successfully and repeatedly. In order to bring Guénon into the intellectual mainstream, Hallaq not only has to interpret him in this way, but also to address another problem that has so long kept Guénon out of the mainstream—or, at least, out of mainstream texts and footnotes, since many people have been reading Guénon without citing him. “That his ideas are esoteric in the extreme and at time outright objectionable,” writes Hallaq, “is of no relevance here.” “Translated into the idiom of the twenty-first century, and transcending its eccentric and unconventional style of expression, Guénon’s critique synoptically captures much of the best in recent social theory, Critical Theory, and cultural criticism.” So: yes, in current scholarly terms Guénon may be eccentric and unconventional, esoteric and even objectionable, but let us not bother with that, let us see what he actually gives us. Restating Orientalism does much more than simply restate Guénon’s Traditionalism, of course. It develops a new critique of modernity, and as well as drawing heavily on Guénon’s work, also draws on a range of other thinkers—Michel Foucault, Carl Schmitt, Antonio Gramsci, and Hannah Arendt, to name a few. 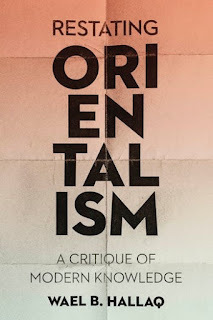 It will be very interesting to see how Restating Orientalism is received. My thanks to Andrew Booso for drawing my attention to this book. Peter Östlund, a Swedish film-maker, has put together a pilot for a film about Ivan Aguéli, the Swedish painter who introduced René Guénon to Sufism. The pilot, which can be watched here, consists largely of readings from Aguéli's correspondence, mostly in Swedish, which will limit the film's international appeal. The pilot lasts 11 minutes, and has quite appealing photography and music. The opening scene is in Spain at the end of Aguéli's life, from where the film moves to the young Aguéli paining on the Swedish island of Gotland. The Swedish title, "Frände av Ljus," may be translated "Kin of Light." The text on the home page reads: "The film revolves around the dramatic life of Ivan Aguéli, his versatility, genius and experimental painting. We want to show Aguéli as the multifaceted man he was, with strengths and weaknesses. A seeker, both after real life and higher things. The continuation of the project now depends on funding. In that process we are also seekers..."
My thanks to Anthony Fiscella for drawing the film to my attention.